There is a huge catalina deal that starts on Sunday, 6/19 at ShopRite. 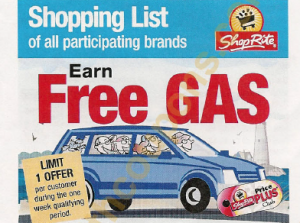 The deal is: Buy $75 in any combination of products from Kraft, P&G, General Mills, Unilever or Tyson and get a $25 Gas or ShopRite** Gift Card. Now, I can tell you that, in the past, offers that have stated the same thing, have worked on pre-price plus prices just like every other offer. But, having said that, I can not guarantee that it will happen with this. Like any kind of deal, we have to see how it goes. The good thing is that since this is tracking throughout the week, we can tell right away how it is working out (as long as it keeps a running total on your receipt). The list is very long so, thanks to reader Brenda, we have a scan of the pamphlet showing all the products. Right now there are way too many too list. So, please check in the LRWC coupon database for products you may be interested in using. And, if you find a coupon that you think would make an awesome deal, please let us know. I, of course, will be doing the same. **Gas Gift Cards are for Hess, Gulf, Shell or BP. 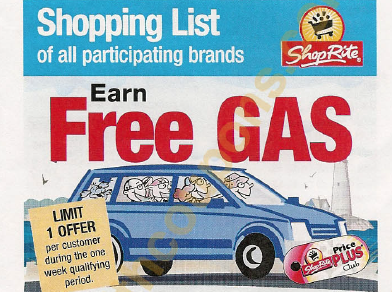 If there is not a listed gas station in your area, you can redeem your certificate for a $25 ShopRite Gift Card. Today’s Daily Deals – Cosmo, Holiday Travel Card, Posh Petals & More!